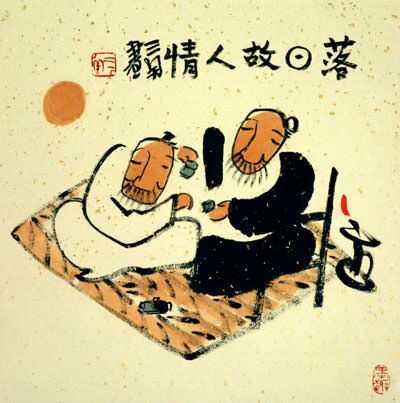 Artwork Panel: 30.2cm x 47.6cm ≈ 11¾" x 18¾"
Silk/Brocade: 39.6cm x 102.8cm ≈ 15½" x 40½"
Width at Wooden Knobs: 48.6cm ≈ 19"
These two characters create a word that means, "harmonious" or, "in perfect harmony". 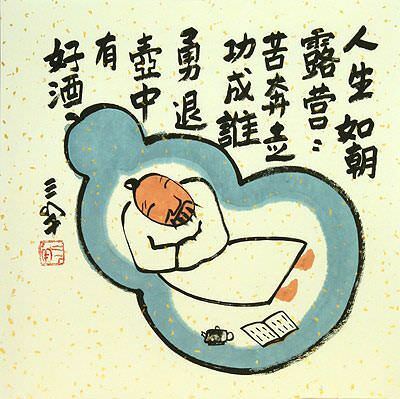 The deeper meaning or more natural translation would be something like, "beautiful life". 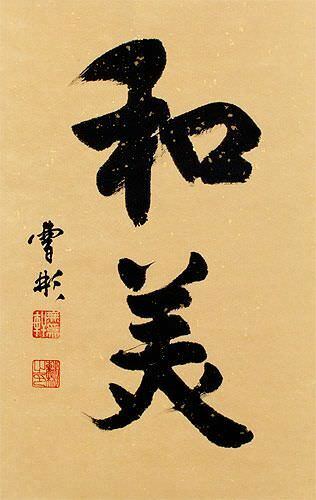 The first character means peace and harmony. The second character means beautiful. But in this case, when combined with the first character, beautiful refers to being satisfied with what you have in your life. This can be having good relations, good feelings, comfort, and having enough (with no feeling of wanting). 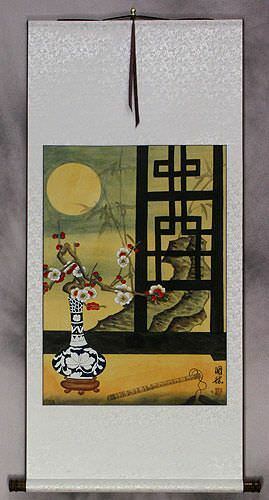 Written by Master Calligrapher Cao Bin using Chinese ink on handmade tan xuan paper, and mounted to a handmade silk brocade wall scroll. I met Cao Bin years ago, and long before his fame. At that time, his wife was running a small house cleaning business. 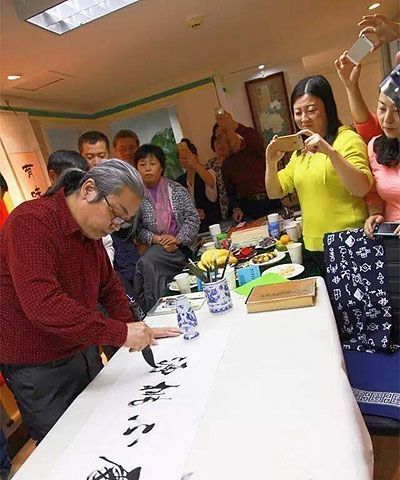 One day she was tidying up my mother-in-law's home in Beijing and overheard that I am in the business of selling Chinese calligraphy and artwork. 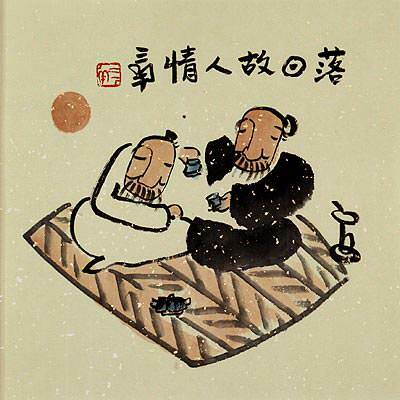 She asked if I'd like to meet her husband who was a pretty good calligrapher as she described him with modesty. 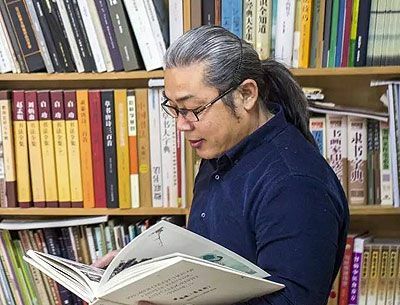 The next evening, I visited his modest studio and saw some really nice calligraphy and great black ink bamboo paintings that he'd just finished. After a lot of tea drinking and chatting, I asked if I could commission a few pieces. Through the years, I would occasionally buy a few more pieces, not realizing how famous he had become. 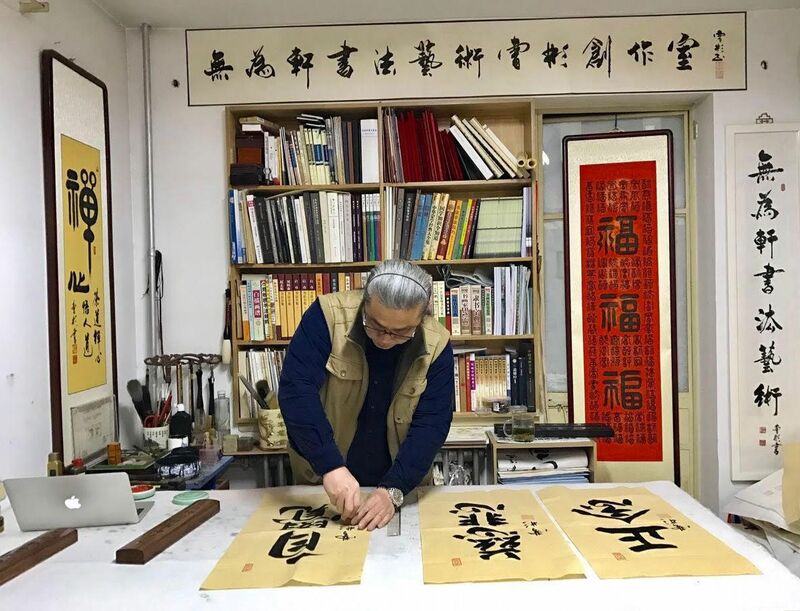 I might pop by his studio, only to hear from his wife that he was down in Anhui receiving an award for his calligraphy (calligraphy competitions are comparable to the fervor that sports championships have in the rest of the world). 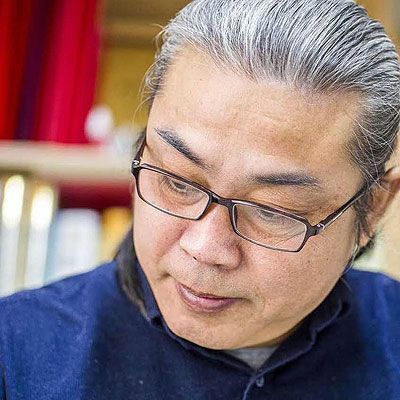 It finally dawned on me that this man I had known for about 7 years was a premier calligrapher for whom books had been published featuring his work, and the recipient of numerous awards. The best part is that I have guanxi (a word that kind of means "special relationship" in Chinese), he gives me better prices than anyone else. 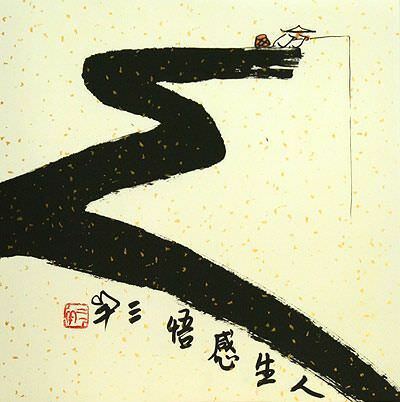 This really fits well with my philosophy to offer high quality Asian artwork that everyone can afford. 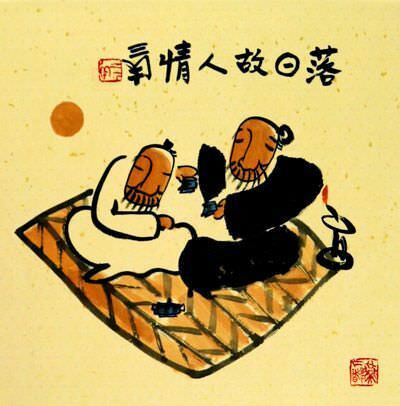 This is painted on xuan paper (often incorrectly called "rice paper"). The raw artwork was then taken to my workshop in east Beijing where the master mounter built it into a handmade wall scroll.